First post of 2016, let's do this. When the big 2-0-1-5 came around a year ago, I remember not being in a good place and wanting more out of life. Those feelings forever preserved in a time capsule through this blog post filled with anticipation and expectation. That entire year came and went and it blew through every single desire I had in my heart of hearts. It was a damn good year. Here's hoping the next one will be just as amazing. It certainly is off to a good start. January has been keeping me busy with the usual stuff: work, recipe testing, friends, drinks, and laughs. There's barely been enough time to despair about winter weather. When February rolls around, we're heading across the ocean to China for the month before coming back in time for leap day. Many noodles and "stinky" eats will be had. Since there is a lot of colorful food to look forward to soon, I decided to start the new year off with something simple and tasty. Something that can be eaten for any meal of the day, made with four easily found ingredients. 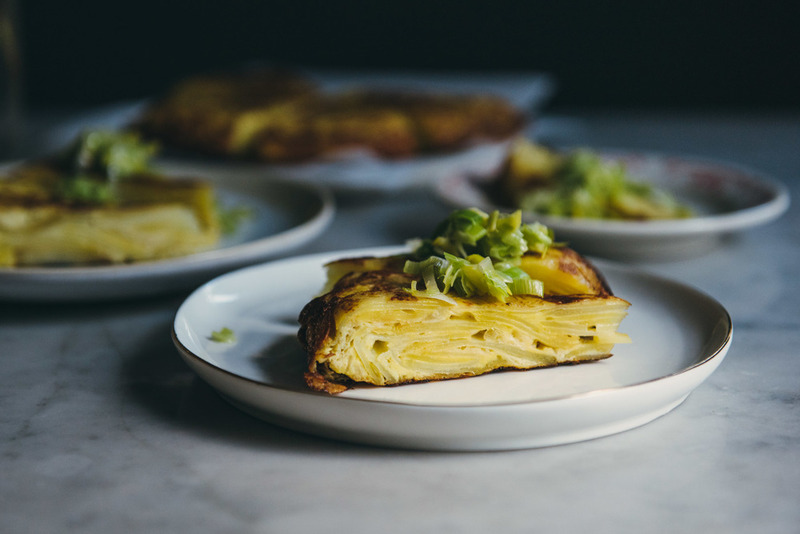 As was described to me the first time I had it, spanish tortilla is like a frittata but better: soft eggs wrapping tender potatoes and onions, delicious at any temperature and endlessly versatile. This article from Fine Cooking really helped a girl out. Hopefully you'll find it useful as well! In my experience, a tortilla takes longer to cook than you would anticipate simply by looking at it from the outside. I suggest erring on the side of more cooking time rather than less to ensure all of the egg on the inside has cooked through. Most of the oil used in this recipe doesn't actually go into the tortilla itself since we're using it for frying, so fear not the cup and a half of oil, only a few tablespoons make it in. You can easily strain and reserve the leftovers for future use. Peel and thinly slice potatoes no thicker than 1/8 inch or even slightly thinner if desired (a mandoline or v-slicer is highly useful). Transfer to a bowl, sprinkle with 1 tsp salt, and toss to coat. Peel, quarter, and thinly slice onion. Set up a large sieve over a heatproof bowl to catch oil drippings. Heat oil in a 10 inch frying pan. When the oil is hot (you can test this by dropping one slice of potato into the oil, if it bubbles heartily, it's ready), drain any water off from the sliced potatoes and fry in two batches. Depending on how thick you sliced the potatoes, each batch will take anywhere between 5 and 10 minutes to cook through. Transfer cooked potatoes to the sieve to drain using a slotted spoon. Next, fry the onions in the same oil, 6 to 7 minutes. While the onions are cooking, transfer potatoes to a paper towel lined plate and pat off any excess oil. When the onions are done, transfer them to the sieve in the same fashion as the potatoes and drain well. Turn off the heat. Crack eggs into a large mixing bowl, add remaining 1/2 tsp salt and lightly beat with a fork. Add the potatoes and onions. Gently combine with your hands or a spatula, talking care not to break the potatoes. Carefully transfer the remaining cooking oil to the same heatproof bowl used to catch the drippings (once cooled you can strain and reserve for future use). Wipe the pan clean and return to the stovetop, turning the heat to medium high. Add 1 tbsp of reserved oil. Once the pan is hot, add the egg/potato mixture and spread in one even layer. Immediately turn the heat to medium low (closer to the low side) and let cook for 8 to 10 minutes, until the edges are completely set and the middle has started firming up. The tortilla should release from the pan easily when you shake it, if not use a spatula or a knife to help loosen it. Place a rimless plate over the pan. In one quick motion, invert the frying pan onto the plate then place the pan back on the stove. Gently slide the tortilla back into the pan, give it a light shake to even everything out, and cook for another 8 to 10 minutes. Turn off heat and let cool for at least 30 minutes. Transfer tortilla to a large serving plate, slice, and enjoy plain or with your favorite sautéed veggie, cheese, or cured meat.